Magicians, the roaring 20s, Saint-Saens’ orchestral masterpiece, and more can be found in this endearing tale of mystery and unconventional romance. Written and directed by the timeless Woody Allen, Magic in the Moonlight is a pleasure to watch–absolutely perfect from every perspective. Emma Stone and Colin Firth are captivating in this memorable tale aptly released by Sony Pictures Classics. Indeed, this is a new classic that all who watch will definitely enjoy. No glitzy CGI, breathtakingly elaborate cinematography, or smoke and mirrors in this magician’s tale. It’s truly a throwback to the very essence of what an excellent film should be. No political, social, or psychological message here; just pure visual and performing art–Ars Gratia Artis. 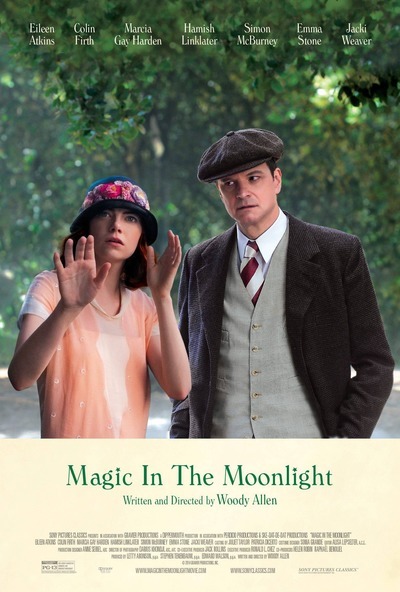 Magic in the Moonlight is about a famous magician (Firth)–think the David Copperfield of the 1920s–who is brought to the South of France to debunk and unmask a self-proclaimed medium named Sophie (Stone). Setting out to reveal her, as he exposed countless charlatans prior to her arrival, he discovers that her claim of clairvoyance may actually be authentic. Watch as the world’s foremost magician uses logic, wit, reason, and science to see through the act, he believes she is putting on. Fortunately for Sophie, her gift has caught the eyes of the South of France’s elite, and the son of great fortune falls in love with her. This movie is full of twists and turns, romance and intrigue–a perfect combination for such a wonderful film. Woody Allen is a brilliant writer/director who can take a simple concept and build a beautiful movie around it. He movies are full of people who face real problems and shows how they work through them. Sometimes they solve their problems, as is the case with Owen Wilson’s character in Midnight in Paris; but other times they are lost in the confusion of their own minds, like the Academy Award winning performance given by Cate Blanchette in last year’s Blue Jasmine. Emma Stone and Colin Firth play off each other so precisely and strategically. Firth’s sarcasm and cynicism is matched by Stone’s charm and optimism. Just goes to show that a wonderful movie does not have to be overly directed or produced in order to showcase a story. Woody Allen never ceases to amaze me at his grasp and understanding of the importance of “story.” Without story, without conflict, there can be no movie. This movie truly relies on the story to carry the film. If you are a fan of Saint-Saens’ Carnival of the Animals, then you will love the opening scene that takes place at a magic show at a theatre in Berlin. Such a beautiful masterpiece. Although only the first few measures are ever heard, in the movie, it really adds a touch of class to the film, giving it a very classically produced feel. From classic orchestral movements to the swinging music of the 1920s, Magic in the Moonlight has a memorable score that definitely creates a perfect atmosphere for the telling of this well-crafted story. Lastly, it isn’t often that a story written for screen can translate seamlessly to the stage. But, this film would make an excellent stage production as well. The movie is dialog-driven and carried by two central characters with a handful of chief supporting cast. Seeing this film brought to stage could allow for a unique experience that cannot be achieved on the screen. Although, it was a wonderful cinema experience, I could see how bringing it to stage could permit the characters to come to life in a different way that allows the audience to immerse themselves into the story. If you have some time, while it is still in theatres, check it out. Whether you are a fan of Woody Allen’s unique style or not, it is a great movie in which all can find enjoyment.